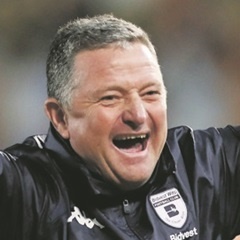 Cape Town - Bidvest Wits will not be affected by Gavin Hunt's absence from the bench when they take on Cape Town City in their league opener in Milpark on Friday, said assistant coach Paul Johnstone. Johnstone will be giving instructions from the bench after the champions' coach was shown a red card in their MTN8 clash against Golden Arrows last weekend. Hunt's number two, however, felt the team was well drilled, and would not miss the coach's presence. "It's not like it's going to be fresh and out of the blue on Friday," Johnstone was quoted by the TimesLIVE website. "The instructions and the planning are done in the week before the game as well as the final prepping in the pre-match meeting and in the dressing room. "All that I'll need to do is iron out a few things if they're not going right on the field. "The guys are professional enough and we’ve been around each other long enough to know exactly what’s expected. And I don’t see any problems whatsoever." The champions begin their title defence at home to Benni McCarthy's Cape Town City on Friday.